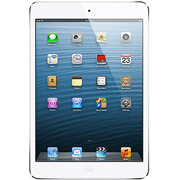 Rifling Montessori: The IPad can do many things, but it can’t fire a round of bullets. At least, mine can’t. Not yet. That’s because Apple won’t license the gun app. Therefore, Apple’s intransigence is violating my second-amendment rights. If the gun app were available, I wouldn’t have had to attend a recent Jacksonville Beach Planning and Zoning Commission public meeting. 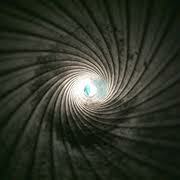 The board was considering granting a conditional use permit on Penman Road for an indoor firing range. 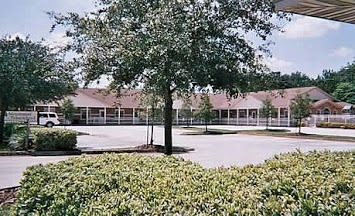 It would be across the street from the Montessori Tides School. 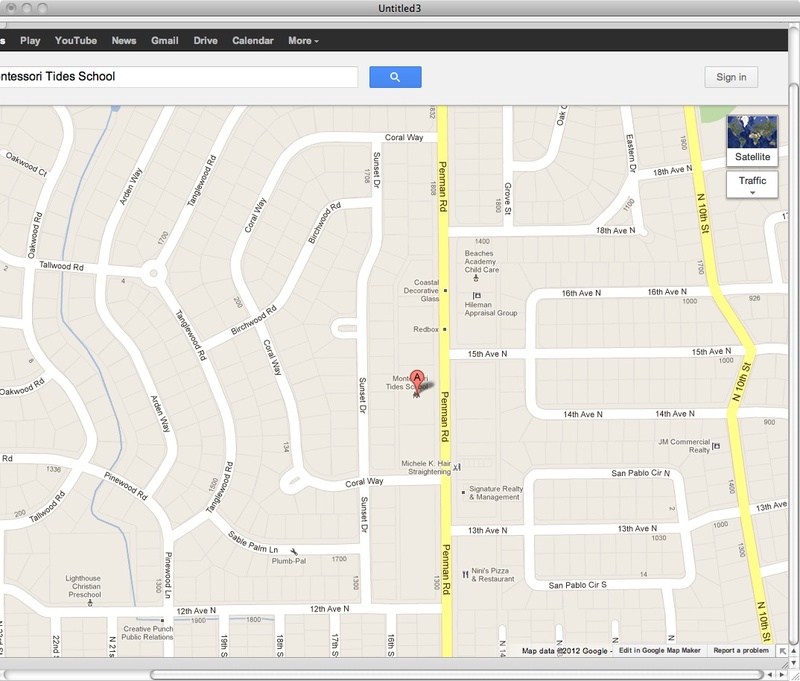 Map of Penman Road area showing location of Montessori Tides School. I was at the Jacksonville Beach Planning Commission meeting to argue for the other side. But don’t misunderstand. I didn’t show up to argue in favor of granting a variance. Nor did I show up to argue for a shooting range across the street. No, I went further: I presented the case for setting up the firing range right inside the Montessori Tides School itself. Wayne LaPierre of the N.R.A. 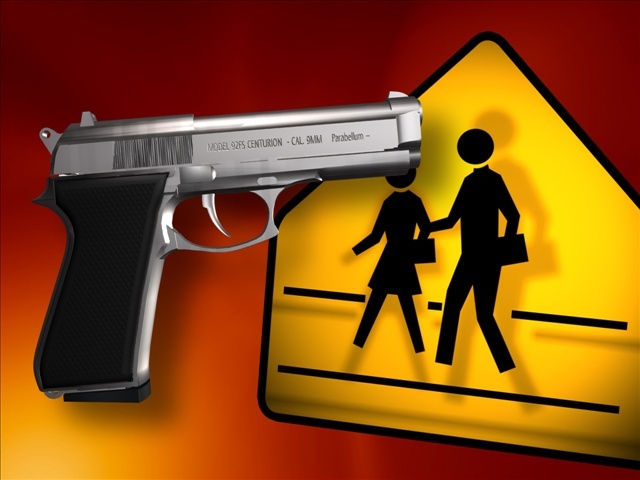 proposes that the way to protect school children is to put an armed guard in every school. But anyone who takes the trouble to think through his suggestion soon realizes it won’t solve the problem. 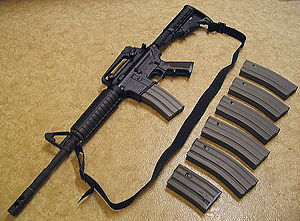 The only workable solution is for K-12 school children to bear arms. Arming them is inevitable. 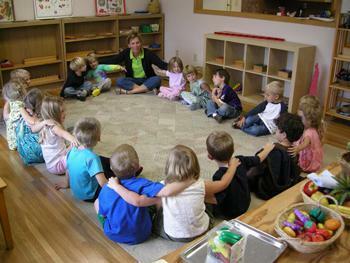 These Montessori parents don’t understand that their children must be trained, right there on the Montessori campus. girl looking through rifle scope at firing range..
Why would a Montessori school be a particularly fitting place to locate a firing range? Let’s go back to basics, because that’s what Montessori in principle is about. 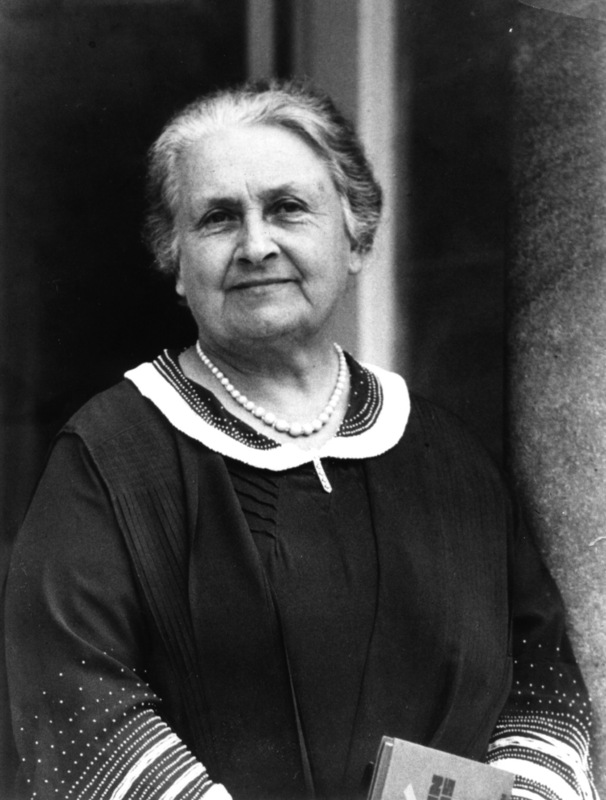 The Montessori movement was founded by Dr. Maria Montessori. 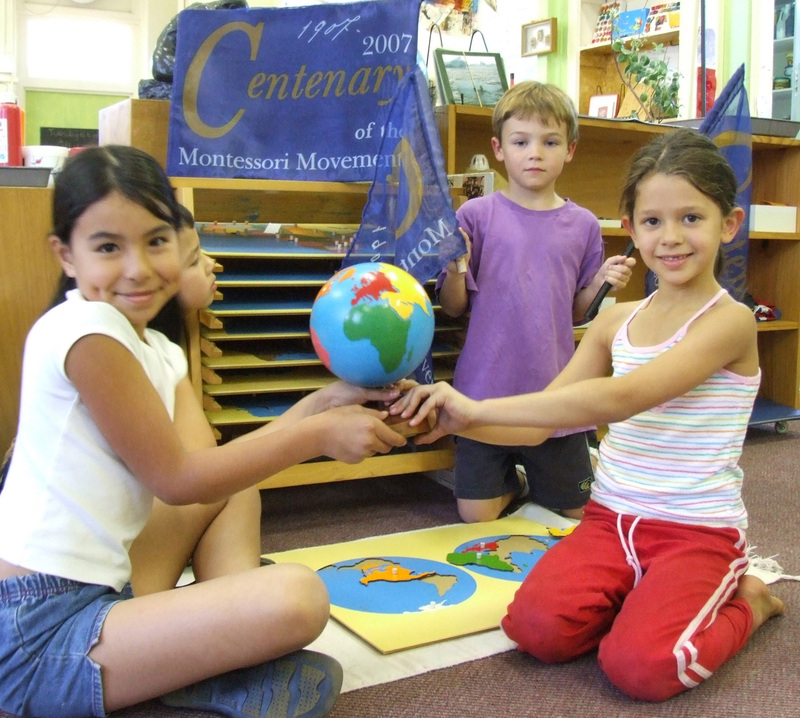 Montessori education aims to teach independence, freedom, and self respect. 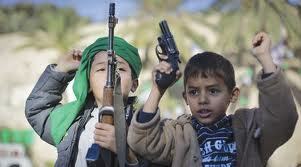 But by not familiarizing children with the aiming, discharging, and cleaning of weapons, how can these goals be achieved? Dr. Montessori’s movement has become decadent. These kids are lollygagging, with no awareness of life’s dangers. They are too young to have read Thomas Hobbes and so don’t understand that life’s a “war of every man against every man.” Any one of their classmates could go berserk and start blowing playmates to kingdom come. People must be prepared to fight fire with fire. Or, more accurately, to fight firepower with firepower. Any classmate could come to school armed and start shooting. Even the teacher’s son. Youngsters must carry firearms to take him or her out. On a moment’s notice, they must be able to down an active shooter. Even one that’s a peer. Not just to disable, but stop him or her cold. To aim for the chest or head. And then, to fire repeatedly into the body while it’s writhing on the floor. To keep discharging bullets even during the involuntary post mortem spasmodic jerking. To make sure he or she is truly dead. That’ll take a lot of rounds. Is that too much to ask of nine year olds? Afterward, the boys must be prohibited from urinating on the body. It’s an American custom that should be discouraged. 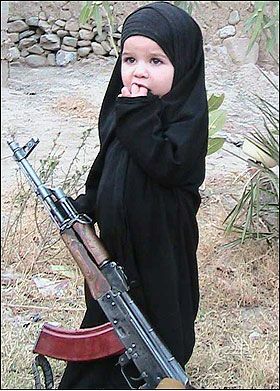 That’s another reason why kids must be trained. They must be taught how to use a firearm, of course, and why killing’s okay, but why it’s not okay to urinate on the body. Why? Because to urinate on a dead body is uncivilized. It’s barbarous. It’s to live like an animal. Unlike living one’s life 24/7 armed to the teeth and ready to kill. And school uniforms will have to be adopted:. Under the supervision of caring, nurturing teachers, the children could practice target shooting. Say, between reading and playing the violin. And with gun training as part of the curriculum, Montessori education really would be about fostering independence, freedom, and self respect. 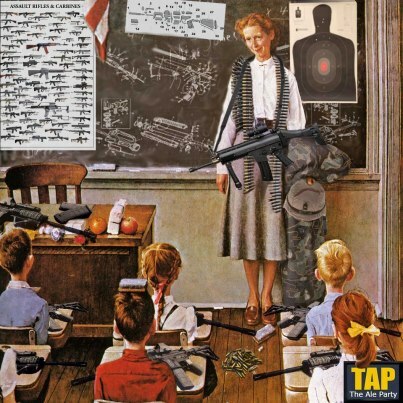 Moreover, with a classroom awash in guns, no child would dare fire on his or her classmates..
Outside the classroom, things no doubt would change. Pretty soon, we would start to see a different set of toys on playground:. 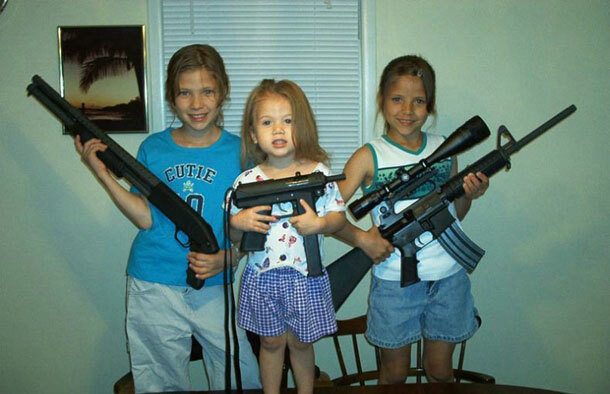 BTW: don’t you think it perverse that kids overseas know more about guns than American children do? American boys and girls have fallen behind. It’s time we helped them catch up. And Montessori should be the institution to do this. So, instead of opposing the installation of a firing range clear across the street on the other side of Penman Road, the Montessori parents should be encouraging its owner to set up shop right there within the school. Shooting. It’s like learning how to play the violin or piano or speak French. The earlier the boy or girl gets started, the better. Being plastic, the child’s brain can absorb anything. 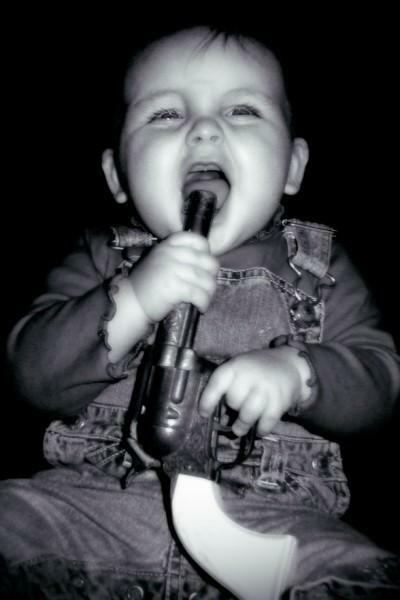 Let a weapon in the hand become second nature. .
From birth, an infant should at all times have an unloaded handgun and should be encouraged to touch and cuddle with it. After all, Montessori is all about tactile experience. .
At ten-to-twelve months, the toddler already will be packing heat. WARNING: do not yet load. At sixteen months, he or she—if walking—should be instructed in how to insert bullets into the chamber, or a loaded magazine into the magazine well, and fire. If the parents want the child to develop someday into a master marksman, they must introduce him or her he to target practice by age four. 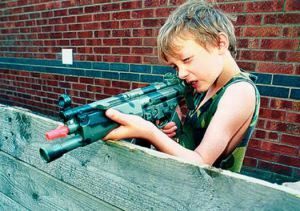 At this age, prodigies on the firing range will appear. By five, it’s too late for the child to achieve greatness. 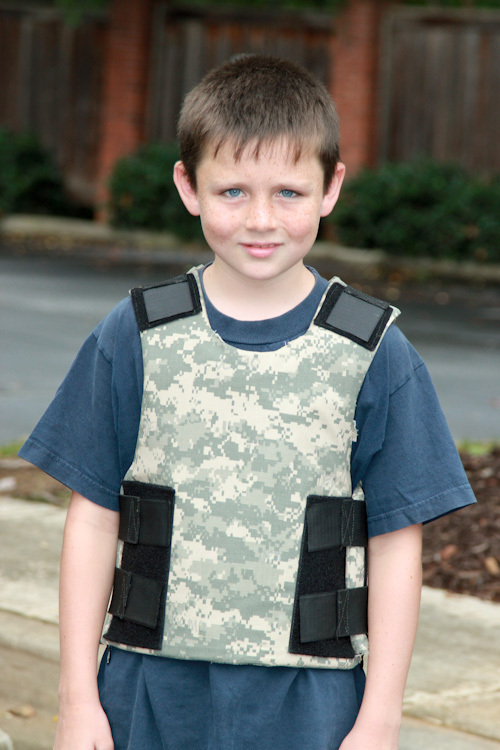 Starting very early, Adam Lanza achieved greatness. 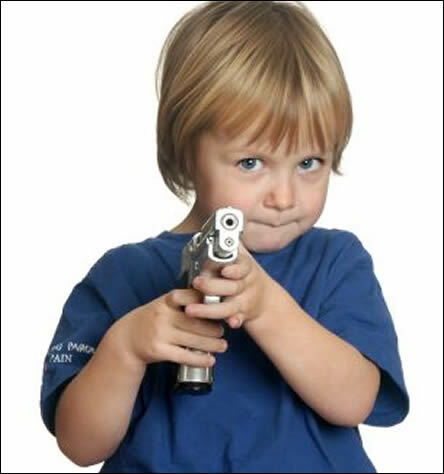 This is not to say that, if the child begins shooting later than five or six, he or she cannot become very, very good. But just as people who came to the piano late can still go to the Van Cliburn International Competitions to admire the virtuosity of former child prodigies, so too can late-beginning shooters go to the National Rifle Shooting Championships and dream of what might have been, if only their parents had placed a gun within their grasp at birth. In other words, if the child doesn’t begin early, it’s not too late to teach appreciation of precision sharpshooting performed by the ones who did receive a gun along with a pacifier. But why do that to a child? Why deny them a chance at glory? 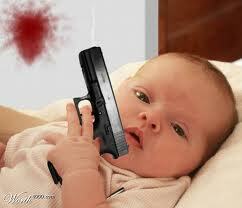 It’s child abuse, really, to not put a gun in the cradle.
. I can’t imagine a better, healthier, saner way to set a boy or girl up for a successful life. 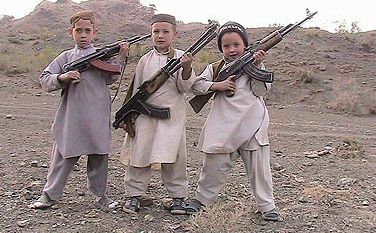 From the age of two upward, training in the handling and maintenance of the .223-caliber Bushmaster XM-15 rifle, the 10mm Glock 20 SF handgun, and the 9mm SIG Sauer handgun would be particularly appropriate. 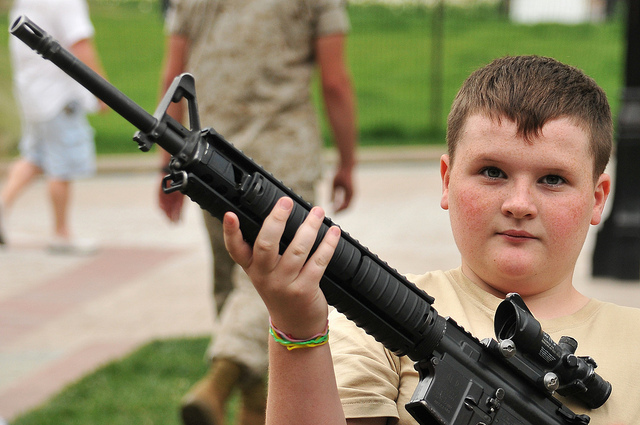 Guns are just tools, and children should learn how to use them. Let the little boys and girls employ these tools to learn how to draw a bead on a target. Preferably one that’s moving. That way, they’ll be able to simulate what it’d really be like to eliminate a fellow classmate who’s firing multiple rounds while on the go. .
Why should foreign kids have chances in life that ours don’t? In so many ways our progeny are falling behind. Poor math scores. Inability to read. Little science education. No legal access to guns. In the 21st century, how are our kids going to compete? A gun in the hand is worth two in the bush. 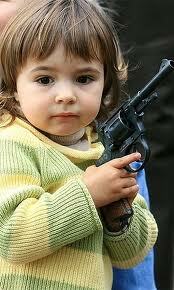 Who else is going to teach the young about guns. The nuns aren’t. And because Montessori is about independence, freedom, and self respect, the task should fall to them. 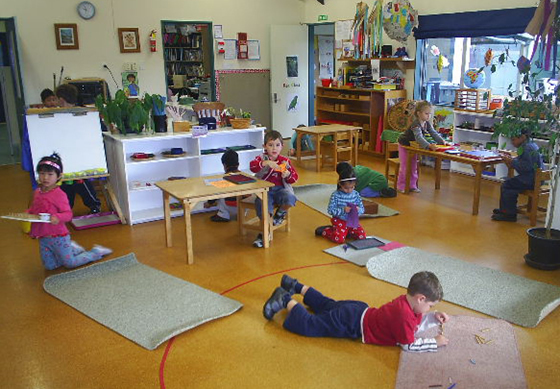 “If play is the work of the child, toys are the tools,” writes Maria Montessori. However, neither the Montessori parents, teachers, nor administrators seem willing to assume this mission. So, in the final analysis, it’s going to be up to Apple. 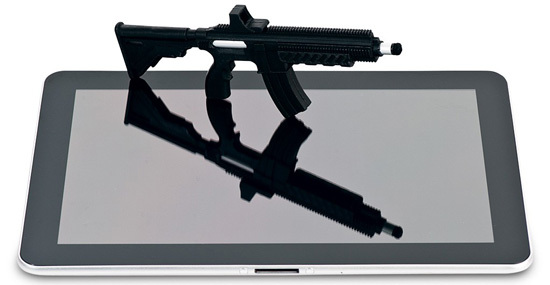 If Apple would just license the gun app for the IPad, things will be okay. 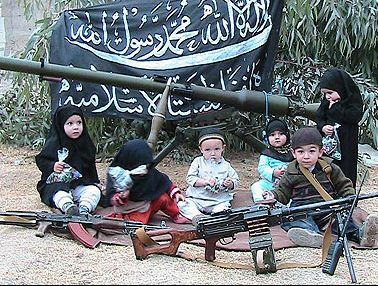 American children would have a chance to catch up with their counterparts overseas, especially those in Afghanistan and Somalia, the ones who have had so much more advanced weapons training. The gun app is the answer. Apple should license it ASAP.